Leka replacement roofs provide the ‘genuinely‘ lightweight, tiled, solid conservatory roof system, through innovation, design and engineering. Leka replacement roofs are JHAI approved and provide a truly lightweight, tiled, solid conservatory roof system (no smoke screens) and with an overall U value of 0.15 it currently dominates our marketplace. 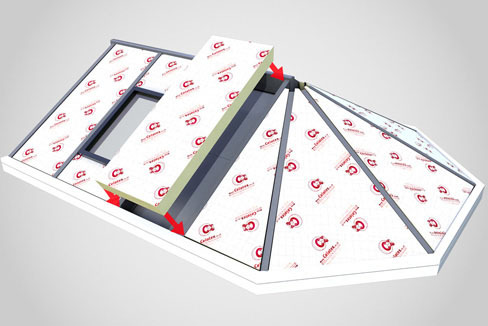 Using GRP or glass reinforced plastic allows a structurally tested, lighter alternative to aluminium and timber when providing the main structural roof rafters. GRP is not at risk of sweating /condensation or cold bridging like aluminium. Nor is GRP open to wood worm, moisture absorption or potential rotting such as timber. Our light-weight Leka System warm roof has been engineered through innovative methods, highly technical design protocols and practical experience to create probably the best conservatory roof system on the market today. 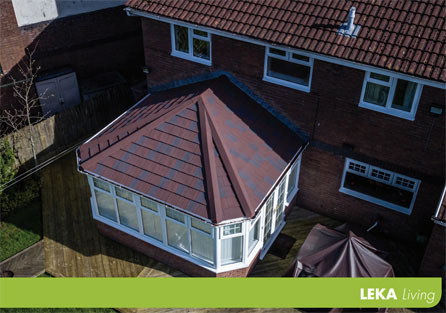 The conservatory roof market is very diverse however the Leka system is very direct in its approach, thus providing only the very best in materials and overall solution. Please view the information provided below and contact us for more details if you do have any further questions. There are no restrictions other than the pitch of the roof to be installed as well as what lies beneath your existing conservatory roof and this is governed by the rules of physics. Whether you want to come and view our products in our showroom or would like a quote over the phone or online we can help. Just get in touch today! For the best possible service and advice, why not come down to our showroom and meet us in person. We have a wide range of products on display and we can discuss your project in detail over a cup of coffee. We are her to help. Email us with your requirements and one of our specialists will get back to you quickly. All enquiries are treated the same regardless of the size of project.